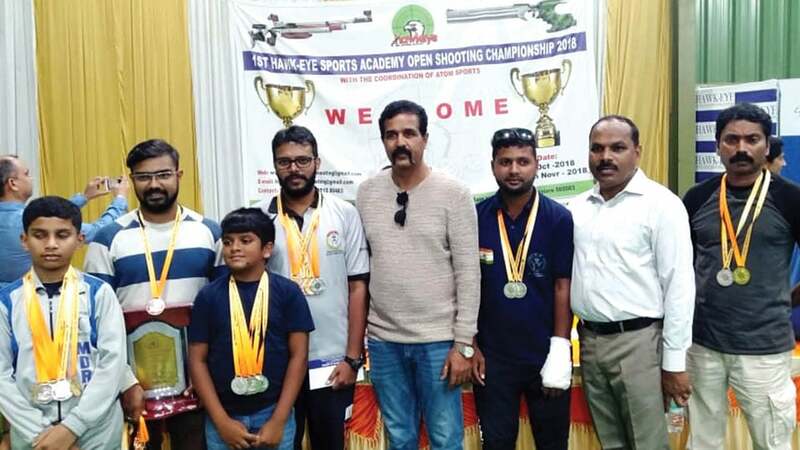 The shooters from the Mysore District Rifle Shooting Association (MDRSA), representing the district in the 1st Hawk-Eye Sports Academy Open Shooting Championship-2018 held at Bengaluru recently, bagged a rich haul of medals by winning a total of 30 medals (7 gold, 17 silver & 6 bronze) in the Championships. 10m Open Sight Senior Men: L. Shiju – Individual gold and team silver (Team members – Shiju, Imran and Farman); S. Keerthan – 4 Individual gold medals (U-12, U-14, U-16 & U-18), 1 silver (U-21) and 4 silver medals (U-14, U-16, U-18 & U-21) in Team event (Team members – Keerthan, Jeet, Nishant). Gyan Ponnappa – Individual bronze in 10m Peep Sight (Sub-Juniors); Rakshith Shastry – 10m Air Pistol – Individual gold, Mixed Pistol – Gold, Champion of Champions – Silver & Senior men’s team ISSF – 1 bronze (Team members – Varun, Rakshit, Sumukh); Varun – 2 bronze medals; M.S. Nagendra – 10m Air Pistol (Para) Individual – 1 gold – ISSF and 1 gold – NR.